Culzean House is the perfect destination for family holidays or group gatherings in Scotland, giving you all the warmth and comfort of a luxury self-catering house - there is even a hot tub (and sauna)for ultimate relaxation! The house is just a 5 minute walk from the beach so perfect for a family holiday. The surrounding area offers picturesque scenery, fantastic forest walks, romantic beach walks and activities such as mountain biking, horse riding, river and sea fishing all on your doorstep. This luxurious holiday house is situated at the gateway to the Highlands in the Loch Lomond and Trossachs National Park. Local activities include quad biking, sailing, climbing, and the River Rocket high speed adventure boat rides on the Firth of Clyde. For those seeking days of rest and relaxation then visit the Benmore Botanical Gardens, board the last ever sea going paddle steamer 'The Waverley' or have a round of golf at one of the many local courses. This is a really wonderful large holiday house, set in some of the most beautiful scenery in Scotland - an idyllic place to stay for a Scottish holiday. Culzean House is a beautifully restored farm house situated on the edge of a deer park offering superb quality accommodation for a large party of up to 14. The recent refurbishment includes new en-suite bathrooms, full oil central heating, a country style farmhouse kitchen, a private utility room with washing machine and dryer, as well as a private hot tub and sauna for use by you and your group during your holiday here. There are 7 bedrooms: 2 double en-suites, 2 large double rooms (can be used as family rooms upon request), 1 double room, 1 bunk room with adult sized bunks, 1 twin (two single beds) with shower room and 1 family bathroom as well as a downstairs WC. The kitchen is fully equipped with all modern conveniences including a dishwasher. There is a full Sky package, HD LCD TV. Outside there is private parking and a very large garden - fantastic for children. Culzean House is situated in the village of Ardentinny on the shores of the Loch Long in the Argyll Forest Park, and is great for exploring the Cowal peninsula, the West of Scotland, and the Loch Lomond and The Trossachs National Park. 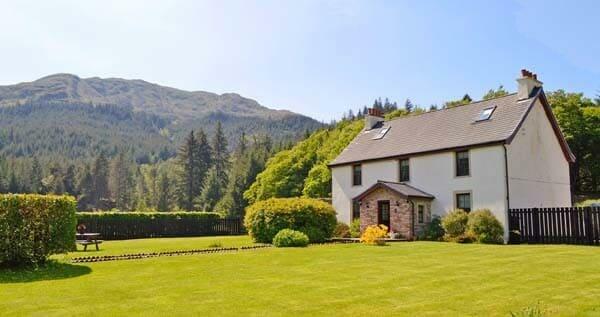 Situated just 10 minutes from the Benmore Botanic Gardens, it's a 25 minute drive from Dunoon, 35 minutes from Inverary, 40 minutes from Loch Lomond or the island of Bute. Glasgow is less than an hour and a half away via the M8 and ferry from McInroys Point at Gourock and just 70 minutes from Glasgow Airport or take the scenic route via Loch Lomond which is the same amount of time. 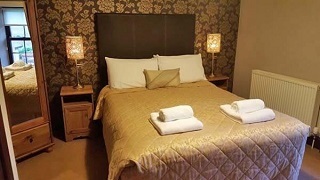 Price includes all heating, electricity, bed linen and towels are provided. Culzean House is rented all year round with flexible changeover days. Weekend and short breaks available. Please contact owners to discuss pets due to the Deer Park. 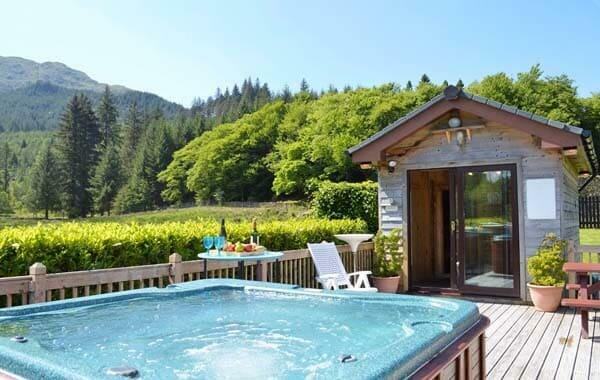 To book this superb large holiday house with a hot tub click the enquiry button below and view availability and rental prices. This fabulous house for 14 is in a glorious setting and only 5 minutes from a beach. It's ideal for a self-catering holiday - with a hot tub and sauna in the garden and great walking from the doorstep, there is lots to occupy all the family at Culzean House.